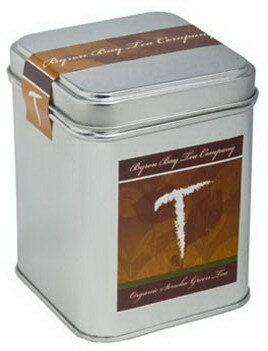 This organic sencha green tea is made from the prized, young, tender spring leaves near the top of the bush. Sencha green tea is a beautiful light green colour when steeped. The traditional handling methods of this tea help to preserve and enhance the tea’s flavour and nutrients resulting in a fine quality green tea. This is a tea that would earn Popeye’s endorsement! The vegetative flavor of this tea tastes a little bit like – yes, you guessed it – steamed spinach. Fortunately, I like steamed spinach! But unlike the strong, powerful taste that you might get when eating spinach, this tea’s flavor is gentle. That gentle vegetative character is enhanced by a natural, delicate sweetness. This sweetness is counteracted with a slight nip of bitterness which cuts through the sweet flavor just enough to keep the flavor interesting and not-too-sweet. Interestingly enough, one characteristic that this Sencha seems to be missing is the creamy buttery note that I often taste in a Sencha tea. And while I do enjoy that buttery flavor – I don’t feel like this Sencha tea is lacking in flavor just because that buttery note isn’t there. This is just different. And sometimes, different is good – it makes for a more interesting cuppa. This tea is one that I recommend serving hot – it just doesn’t taste as good when it cools. It doesn’t really need any sweetener, but it is quite nice with a thin slice of lemon or lime. This Sencha tea is smooth and agreeable – just the right amount of vegetal sweet and bitter. I like it.